Did you know that more than 100 medical disorders can masquerade as psychological conditions? Depression and anxiety are symptoms of hundreds of different conditions, but most people don’t associate them with certain physical conditions or infections, like Lyme disease, placing them squarely in the mental health category. Yet, there’s no denying that the mental and physical are unequivocally linked. While some mental conditions can cause physical symptoms, we commonly see physical illnesses create mental symptoms, and Lyme disease is no different. If you have Lyme disease, anxiety and depression are extremely common, essentially making a horrible situation even worse, but finding relief is possible. 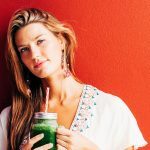 Healing your body means understanding the importance of mind-body medicine and a positive emotional state on the healing process, but first you have to know what causes anxiety and depression and how they’re linked to Lyme disease. A wide range of life events or genetic factors can cause anxiety or depression, including disease. Research also suggests that there are certain lifestyle choices that are modifiable risk factors as well, such as diet, exercise, and exposure to chemicals. It is often thought depression and similar conditions are caused by what we call “chemical imbalances,” but the truth is, it’s more complicated than that. Harvard Health describes how our brains have certain neurotransmitters that keep our senses, movements and moods on track, but in cases of depression the system can have “receptors that may be oversensitive or insensitive to a specific neurotransmitter, causing their response to its release to be excessive or inadequate” or they may send a weakened message if there’s too little of the neurotransmitter. Basically, any tweaks in our brain chemistry can cause significant mood alterations. While some studies claim anxiety or depression are independent conditions, others have found them to be interrelated in some instances. The question is similar to the chicken and the egg scenario. Are anxiety and depression causing some chronic illnesses, or are they a byproduct of chronic disease that’s affecting the body? There is research for both depending on the chronic condition, but either way, dealing with anxiety and depression while living with a chronic illness is difficult. Although anxiety and depression often have different causes, they share many similar treatments and symptoms, and their symptoms can drastically change daily life, exacerbating chronic conditions, like Lyme. These symptoms overlap with dozens of other conditions as well, but it’s important to recognize the distinction between normal stress or sadness and a clinical condition, which is where diagnosis comes in. Medical professionals diagnose depression or anxiety by performing physical, psychological and other diagnostic tests to see if you match the criteria. Most of the time, if you exhibit 5 or more symptoms of the condition, a diagnosis is likely. It’s important to distinctly identify the differences between common emotions and clinical conditions, such as the difference between sadness and depression. One of the major differences is persistent symptoms. It’s normal to feel sad at different points in our lives. We’re human after all, but if the feeling is continuous or if you feel sad about everything, then it’s most likely depression and definitely worth bringing up to a medical professional. Always speak with your doctor to rule out conditions first, like hypothyroidism, and ask how to proceed if you’re diagnosed with depression or anxiety. Does Lyme Disease Cause Depression and Anxiety? Most people aren’t aware of the link between Lyme disease and depression or anxiety. Lyme Disease, or Lyme Borreliosis, caused by Borrelia burgdorferi and spread by ticks, is mainly known to cause arthritis and neurological disorders but can also cause psychiatric symptoms such as depression and anxiety. The good news is that it’s not all in your head. These very real symptoms can be brought on by a number of different reasons. People with chronic medical conditions have a higher risk of depression and anxiety, and coupled with a chronic condition, they tend to worsen each other, according to some studies. 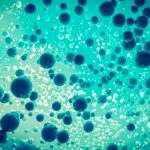 Inflammation plays a causal role in the array of neurologic changes associated with Lyme disease, according to a study published in The American Journal of Pathology, and a growing body of research indicates that inflammation plays a key role in mood disorders and mental illness overall. Gut health in general is crucial to overall health. When the gut is out of balance, it throws off everything in the body because your gut and brain are in constant contact thanks to the gut-brain axis. Most people with Lyme suffer from a leaky gut, where the intestinal lining has developed holes and is no longer functioning properly, this allows undigested food molecules and other “bad stuff” to flow freely into your bloodstream, and causes deficiencies in digestive nutrients, affecting a person’s mental status and mood. Nutrition is a critical component of mental health. It’s common to see even simple changes in a person’s mood when they haven’t eaten, such as anger or irritability, but diet also plays a key role in our health. Studies have shown diet quality is poorer in persons with depressive and anxiety disorders. Some research has discovered that diet modification can reverse symptoms of certain chronic conditions and increase overall quality of life. Lifestyle choices also affect symptoms of depression and anxiety. Household toxins contribute to depression and anxiety also, which is why we’re recommended to stay away from toxic mold, pesticides (organophosphates), mercury and some prescription drugs. According to a study published in the Annals of Epidemiology, people exposed to pesticides have nearly a six-fold increased risk of suffering from depressive symptoms. Since Lyme is an infection that affects multiple systems, it can also be managed by making several changes like those listed above. Various forms, such as Neurological Lyme Disease, also referred to as Lyme neuroborreliosis (LNB), can manifest in different ways, but anxiety and depression are commonly experienced, as well as cognitive decline, memory impairment, and much more. Living with Lyme disease or other chronic illness has its own challenges, but when depression and anxiety come into play, it’s even more difficult. No treatment or management plan is a one-size-fits-all and often, the best results are found when a series of changes work together. 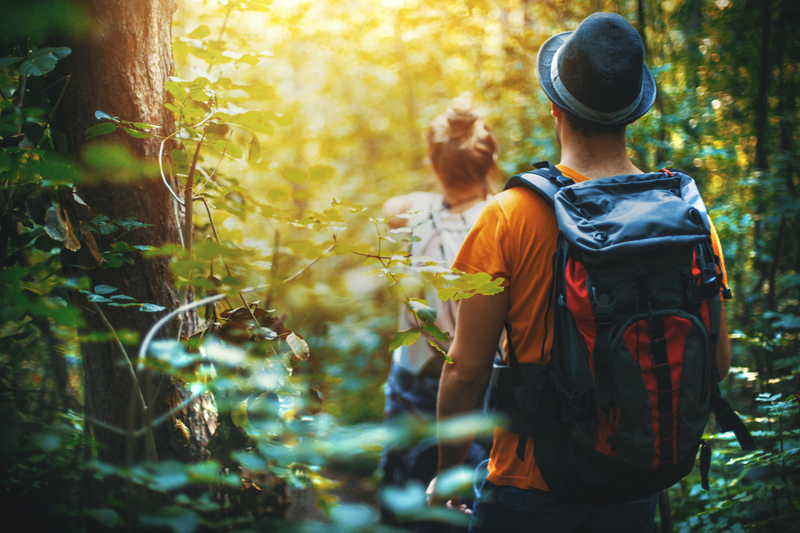 Try these 7 ways to manage your symptoms of lyme disease, depression and anxiety, and remember to always consult your doctor for direction and support. You’ve heard it a thousand times, but exercise is pivotal to a better quality of life. It essentially creates a cascade effect, which releases endorphins, decreases stress and inflammation, improves sleep, lowers blood pressure and so much more. Over time, exercise may also prevent relapse and is as effective as antidepressants. “For immediate relief there is no better or more natural approach than aerobic exercise, and many studies have demonstrated its efficacy. I recommend 30 minutes of continuous activity, at least five days a week for best results,” says Dr. Andrew Weil, a world-renowned leader and pioneer in the field of integrative medicine, Harvard grad and published author. The hardest part is getting started and when you live with depression or chronic illnesses, it can be even more difficult, but even as little as five minutes of movement will help, according to Harvard Health. The important thing is to find an activity that’s fun and works for your lifestyle. If you’re bedridden or sick, even light activities can help. These activities may include muscle-stretching, muscle contractions, light resistance training, easy lifts and pelvic tilts. If you’re able to move freely even if it’s slow, taking short walks can make all the difference. Speak with your doctor or physical therapist for tailored exercises. Relaxation techniques can improve your quality of life and may reduce symptoms of depression and anxiety, but where do you start? Begin breathing exercises – Performing deep, mindful breathing exercises releases tension and promotes overall wellbeing. As you regulate your breath, anxiety subsides and stress decreases dramatically thanks to the increased oxygen supply your body and brain are receiving. Engage in meditation – There’s a reason why meditation is on nearly every list for treating depression, anxiety, chronic conditions, and mental health as a whole. The good news is that it doesn’t need to be complicated and there’s no wrong way to do it, plus you can find free meditations everywhere. Start by looking up guided meditations on YouTube or download apps, like Insight Timer, Calm, or Headspace. Allow yourself to feel what you’re feeling and don’t try to force anything – Intentionally spending time with your emotions without feelings of guilt or shame creates space to observe thoughts and feelings. Plan a day to be alone and wallow. Maybe even spend some time writing about the feelings and why they’re there, but remember to be kind to yourself and practice gratitude, which has been linked to lower depression rates in chronic illness. • Progressive muscle relaxation involves lying down and focusing on a particular group of muscles. You consciously relax them, then tense them for a while, and then completely relax them again. Repeat these steps with different muscle groups until the entire body is in a deeply relaxed state to improve your awareness of your own body and tense areas. • Yoga combines various breathing exercises, meditation, muscle relaxation and physical poses to create awareness and relaxation in the body. • Massage also relieves muscle tension. While antidepressants are often prescribed for depression or other mood disorders, according to studies, roughly 20% of patients do not show improvement in reduction of anxiety or depressive symptoms, but emotional support has lasting effects. Talk with a friend or family member who you know will listen, reach out to a professional trained in this area (counselors, hotlines, therapists, etc.) or join support groups. Despite the negative stigma, more resources are being created every day for mental health support, and while it may be difficult to reach out, your mental health may get worse and you can suffer longer if you don’t. You’re at risk for Vitamin D deficiency if you’re living with chronic illness, and studies have shown that this lack has played a key role in the development of depression. Some studies have even found that depression and low sunlight exposure created cognitive impairment. Try taking a walk or exercising outside to increase feelings of wellbeing and vitamin D levels. Also, setting up your environment for early sun exposure does wonders for your depression and anxiety symptoms. Studies have found that early exposure to sunlight or very bright artificial light in the morning causes a person’s nocturnal melatonin production to occur sooner, which makes it easier to get to sleep at night. It’s no secret that when you have a bad night’s sleep, everything else is thrown off, and the fact that we spend a third of our life sleeping means that this area requires attention. The relationship between mental health and sleep is complex; depression or anxiety may cause sleep disturbances and sleep problems may cause anxiety or depression, among other disorders. Chronic Lyme disease and fatigue go hand in hand, too, with some studies saying that people living with this tick-borne infection are more likely to experience poor sleep quality. So how do you tackle sleep problems? While removing things from your environment, like screens, or getting new pillows can do a great deal, adding exercise to your daily routine can also help significantly. Try setting up a sleep schedule so you go to bed at the same time every night and wake up to the morning light to get the added sunlight affects mentioned above. Antidepressants are often the go-to for anxiety or depression, but they aren’t for everyone and they may not help if other areas are lacking, such as vitamin deficiencies or emotional support. Initially, antidepressants were approved for short-term use and are often not the long-term solution, so taking them for a short time while you enact lifestyle changes could help tremendously. If you’re looking for more natural ways to manage your anxiety or depression, talk to your doctor about natural supplements, such as S-adenosyl methionine (SAMe), St. John’s Wort, or B-Vitamins, like Niacin. SAMe is a naturally occurring molecule that is widely used in Europe for depression, arthritis and other ailments, and while there’s limited research on the use of SAMe, it’s been shown to be equal to, if not more effective, than pharma antidepressants, according to Harvard Health. St. John’s Wort is a plant that grows in the wild that’s been used for centuries to treat mental health conditions. It’s widely prescribed for depression in Europe and appears to have fewer side effects than pharma antidepressants. B-Vitamins, like Niacin (B6), are pivotal to our body’s systems and often necessary in the body to improve neurological health, fight infections, and support cellular function. B-12 deficiency is common in patients with Lyme and other tick borne diseases, and taking it supports the central and peripheral nervous system, improving immune function and energy. Regardless if its antidepressants or vitamins, understanding the effects it could have on you gives you more control of your chronic illness management. According to The New York Times, many people taking antidepressants discover they can’t quit due to withdrawal symptoms. 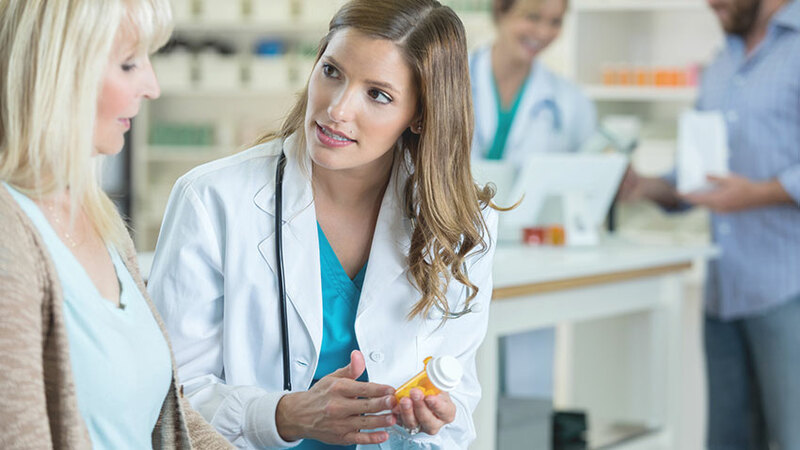 Always research and consult your doctor before taking any medication, and remember to discuss the pros and cons of taking each. As if living with Lyme disease wasn’t difficult enough, multiple nutritional deficiencies are common. When your brain and body are deprived of good-quality nutrition or if you’re ingesting food with inflammatory properties, such as refined sugar, the reaction is severe – chronic illness, depressive symptoms, compromised symptoms and so much more. Most people have nutritional deficiencies, but when you have a chronic disease, it can exacerbate symptoms. While taking supplements can help, as discussed above, making small changes to your diet can tremendously affect your Lyme disease and mental health symptoms. Gut health is especially important to a well-functioning body, and while trillions of bacteria live in your digestive tract, some are good and others can damage your body. Certain diet modifications can increase good bacteria, limit inflammation and shift the way your body functions naturally. • Avoid processed foods, added sugars or flours. • Eat more natural foods such as plants, seeds, and nuts. • What we eat affects every part of our health. Seeking professional help is a great way to get your nutrition on track. Support, nutrition, medication, exercise – all the things you need to do can be overwhelming to get healthy on every level, but you don’t have to do it alone. 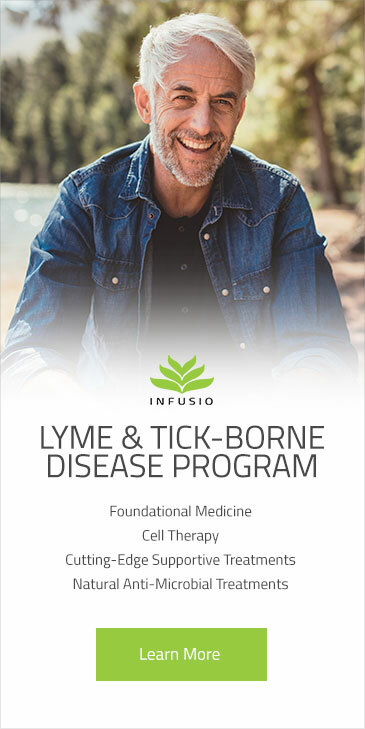 The Infusio Lyme & Tick Borne Illness Program treats people using foundational medicine, which includes multiple lifestyle and medical interventions. Infusio’s relaxed atmosphere allows you to calm your mind and recalibrate your systems using breathing exercises, meditation and much more to create a positive emotional state and foster an environment conducive to healing. Living with any chronic condition isn’t easy, but your anxiety and depression don’t have to debilitate you. Infusio’s programs utilize mind-body medicine at their core and if you’re suffering, you can always reach out to one of our Patient Care Coordinators, who have gone through exactly what you have. Each coordinator has experienced Lyme disease and depression/anxiety symptoms, so reach out even if it’s just to talk. They are there to support you. Infusio is a unique, multi-level approach to healing, designed by British naturopath Philip Battiade for the treatment of chronic degenerative illnesses such as Lyme disease, autoimmune disorders, neurological disorders and cancer. The framework of the Infusio Concept consists of the Five Steps To Health, a foundational system that helps determine each patient’s individual needs and then optimizes their health. Integrating the best of traditional European medicine, alternative medicine and cutting-edge science, offering services ranging from Bioenergetics to Cell Therapy and rejuvenating spa treatments, Infusio provides a 360° individualized approach to health.